Hugh Jackman, up to no good as Blackbeard in "Pan." The cleverly imaginative and visually stunning "Pan" soars as a potential new fantasy-film franchise, easily overcoming a few flaws that threaten to drag down its maiden flight. Although ostensibly a prequel to "Peter Pan," Jason Fuchs' screenplay feels more like an inventive alternate-universe interpretation of how J.M. Barrie's classic character ended up in Neverland, with revamped versions of its intriguing inhabitants. As the first words of the film announce, "This isn't the story you've heard before." A hookless James Hook (the roguishly tongue-in-cheek Garrett Hedlund) is more cowboy than captain. The book's Native American Tiger Lily (a delightfully deadpan Rooney Mara) seems to be from a much more multi-cultural and outrageously outfitted tribe. 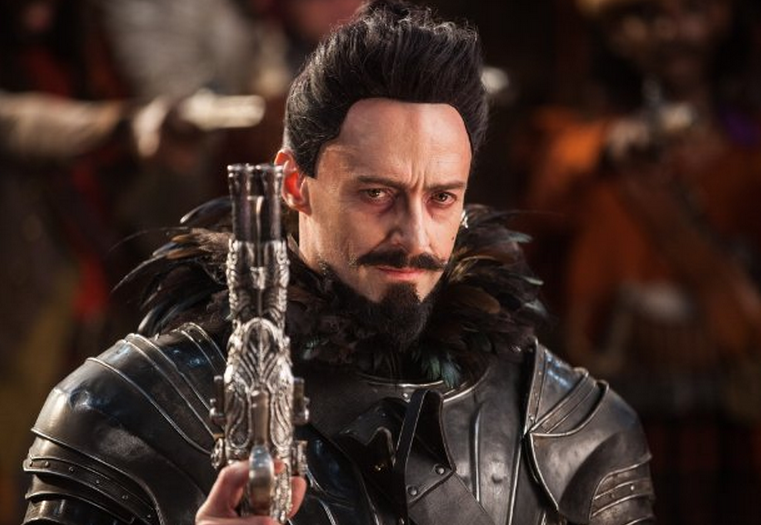 Blackbeard (an unrecognizable and insanely appealing Hugh Jackman), only mentioned in passing in the novel, is fleshed out as the movie's flamboyantly hammy fiend. Levi Miller is a sweetly sincere, self-doubting but nobly determined 12-year-old Peter, displaying less impishness and more precocious maturity than traditional versions of the character. He and his fellow "lost boy" orphans are spirited from World War II London by Blackbeard's flying pirate ship, which comes under nighttime attack by RAF fighters in the first of many dazzling CGI scenes. The movie's first stumble comes when the ship arrives in Neverland, where hordes of laboring pixie-dust miners greet it by belting out Nirvana's "Smells Like Teen Spirit." That grunge anthem somehow feels even more inappropriate here than it did in 2011's "The Muppets." As the garishly attired Blackbeard joins in, it's hard not to worry that the proceedings might mutate into a "Moulin Rouge" camp-fest. A later rendition of "Blitzkrieg Bop" feels similarly out of place, even with Blackbeard's rationalization that Neverland exists in "every age and era." Also, the movie's score (by John Powell) is so omnipresent and frequently bombastic it threatens to overwhelm many scenes that would have been better served by a more subtle approach, or with no music at all. There's so much to like about "Pan," however, that its missteps are easily forgiven. Mara is so earnestly no-nonsense and casually captivating as Tiger Lily that she could be Emily Blunt's spunky kid sister. Hedlund is good at playing Hook as the archetypal would-be cynic who's not as self-centered as he seems. Jackman gleefully steals every scene he's in, dispensing such devilish pirate dialog as "I don't do mercy." Best of all, the fantastic Neverland settings are beautifully rendered. Highlights include an escape from an aerial tram that leads to a pirate-ship skyport, and watching two of those flying galleons battle through a fairy-filled crystal cavern. Director Joe Wright ("Anna Karenina," "Hanna," "Atonement") manages to evoke several other movies without seeming too derivative. The most obvious is "Harry Potter and the Sorcerer's Stone," considering that Peter is a classic chosen-one orphan destined to lead an uprising. More unexpected are bits that bring to mind moments from "Superman," "Star Wars" and even "Mad Max: Fury Road." "Pan" also is audacious enough to leave unanswered the question of how its events possibly could jibe with those in Barrie's book, which would require an awful lot of attitude adjustment on the part of at least three characters. Then again, that's what sequels are for.